Video clip synopsis – The Kahootz 3 Xpression is a 3D animation that includes image, Japanese text and Japanese language. Broadband MP4 japanese_bb.mp4 (5.9MB), suitable for iPods and computer downloads. Students can view the Japanese Xpression as a model in order to create their own scene to represent one of the seasons (for example, winter). They can duplicate the scene and change it to represent the other seasons by using relevant colour, atmospheric effects, objects and sounds. Viewing this Xpression will assist students to understand Asia, to develop informed attitudes and values, to know about contemporary Asia, and to connect Australia and Japan (refer to National Statement for Engaging Students with the Studies of Asia). 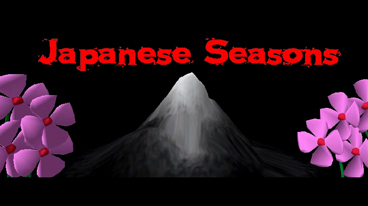 Research the seasons in the context of Japan (or another country). Research the Japanese terms for each. Practice using Kahootz to develop skills with the menu and functions.